Names of famous academicians and professors, painters and sculptors are entered in 70 years of history of the faculty. Leading experts in the field of art – M. V. Alpatov, V. N. Lazarev, N. G. Mashkovtsev worked there; drawing and painting – K.I.Finogenov, P.P. Sokolovskaya, N. P. Khristenko, V.P. Efanov, F.P.Reshetnikov, B. M Nemensky; plotting – V. O. Gordon, G.A.Vladimirsky, A.D.Botvinnikov; training techniques – N. N. Rostovtsev, V.S.Kuzin, E.V.Rustle and many other. Today, following tendencies of modern education development, the faculty continues to keep and develop fundamental traditions of the Russian art pedagogics. Scientists, artists and teachers work at faculty known in our country and abroad: Lomov S.P., Bartzsitzs R.Ch., Demchev P.G., Ignatyev S.E., Karev A.A., Katkhanova Y.F., Kovalev A.A., Kozlov V.I., Korzinova E.I., Kebedko V.K., Prokofiev N. I., Cheremnykh G. V., Cherny V.D., Yablonskaya T.V. and others. 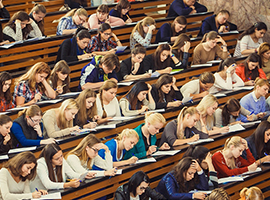 Pedagogical education, preparation profile: Fine arts and additional education. A full-time course of study, training term — 5 years. History of arts. Full-time course of study, term of training — 4 years. Design, preparation profile: Graphic design. Full-time course of study, term of training — 4 years. Arts and crafts and national crafts. Full-time course of study, term of training — 4 years. Training on all directions of preparation is conducted on the budgetary and contractual (paid) basis. 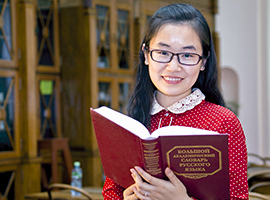 After obtaining the bachelor’s degree it is possible to continue training in a master studies, and then in postgraduate studies and doctoral studies of MPSU. «The fine arts in system of continuous art education», a full-time course of study, term of training — 2 years. History of arts, on the master program «Art in the historical process», a full-time course of study, term of training — 2 years. Training on all directions of preparation is conducted on the budgetary and contractual (paid) basis. Among the main of studied subjects — pedagogy, psychology, methods of teaching fine arts, academic drawing, academic painting, art printing (printing, etching, linocut) and computer graphics, the basics of decorative art (art and art processing technology fabric, wood, metal, ceramics), history of culture, art, design , the foundations of the theory of images, graphic design, design engineering, and others. From the first course students are engaged in art creativity and research activity, participate in exhibitions and competitions in city and country scales. «Techniques graphics», «Techniques of Painting», «Methodology of Art History», «The methodology of art education», «Digital Media in Education», «The design of the educational environment», «Cultural and educational work on the history of art in the school», «World Art», «Russian folk culture», «Techniques and technologies (artistic textiles, art pottery, etc. )» etc. In specialized audiences the students have possibility to study modern computer software in the field of graphic design. 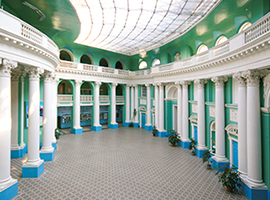 The special place in the life of students is occupied by practicians: educational (city and outside) on the fine arts (open-air), museum (in the central museums of the country), pedagogical (in educational institutions of Moscow), production (in printing houses, the design companies, art museums, workshops and other cultural institutions and arts). The student council organize competitions, humour club, sports competitions, excursions, rest in improving boarding houses and other collective leisure actions for students. Graduates of the faculty work at in mainstream schools, establishments of secondary, higher professional and additional education, museums, galleries, the research centers, in the sphere of art, design, advertizing.